I used to scoff when I would hear about these geniuses who own titan businesses, rule the world and also supposedly spend most of their time reading. I just didn’t buy that someone with that much to do on a daily basis was instead spending the whole time curled up with a book. Turns out, it’s not as unattainable as I once thought. As a matter of fact — reading as much as possible can only help us as entrepreneurs and in our businesses. Reading is an excellent way to keep your brain’s muscle trained and ready for anything. And the best part about books? They’re often a direct line to someone’s years of hard-won expertise and research. That makes it an invaluable time saver. 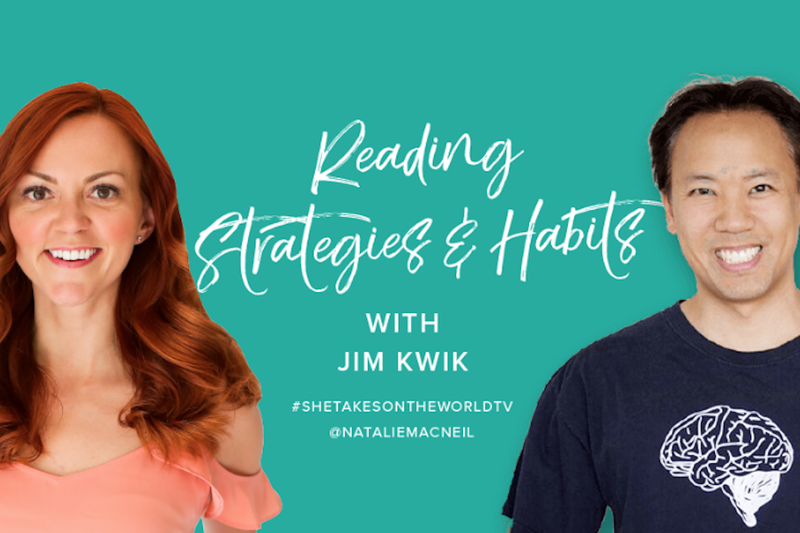 Today on She Takes on the World TV, Jim Kwik is back for another round of the Kwik Habits series, all about books and turning yourself into a lean, green, reading machine! Click play on the video, where we discuss his daily reading habits — and the strategies he uses to read super fast while also absorbing the information. Kwik once read one book a day for four-and-a-half years. I know, I know — that’s advanced, but he does have some techniques guaranteed to help you improve your reading speed and keep your brain from wandering off in the middle of every paragraph. Read faster and notice your brain’s real power pace, beyond the subvocalization. Block off time every day to read . Let’s dive into those books that have been sitting on our shelves for months — and turn years into days with the help of our very own minds. Remember, I’ll be trying this out right along with you so keep me posted on Instagram or in the comments below!